After last year's daytime collaboration of music and tomfoolery, Just Jack and Stamp The Wax are back together for round two of their outdoor soirée - 'Lets Take This Outside!' on Saturday 6 June. This time Just Jack are taking over two gritty urban spaces in the Motion complex: the Crane Yard and front courtyard, neither of which have been used before as outdoor arenas. This year, five guests will join Just Jack across two stages, ready for a party in the great outdoors. 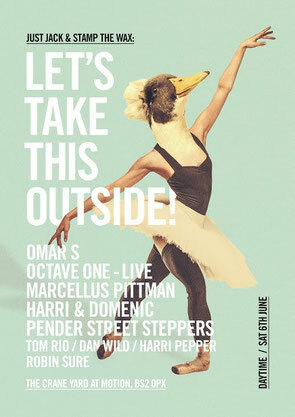 Heading up the bill is Omar S, who will be joined by the American techno duo (and siblings) Octave One and Marcellus Pittman. Also joining the line up will be Subculture's Harri & Domenic and Pender Street Steppers, who were recently ranked as XLR8's number 1. 'New Artist For 2014', alongside Just Jack regulars Tom Rio, Dan Wild, Robin Sure, Jethtro Binns and Harri Pepper.